Fit 4 Two recently challenged all it's franchisees to a 'Walk the Walk' Wellness challenge. As Fit 4 Two founder, I am joining the challenge with my team. #3 on the list is to create a weekly meal plan. I plan to repeat my meal plan 2X. 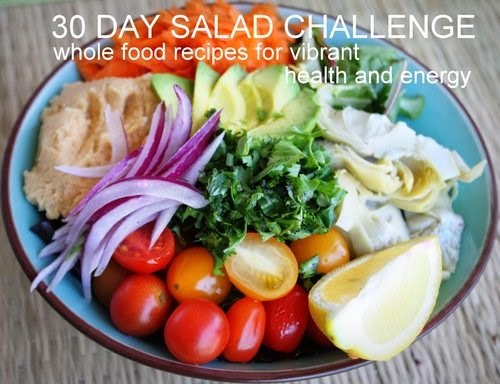 The only thing that will change is the salad because I am using holistic nutritionist Annaliisa Kapp's 30 Day Salad Challenge eBook. Aside from being full of delicious and healthy salad recipes, it comes with a weekly shopping list. I should note that my kids (10 and 7) helped make the meal plan. They mainly helped plan breakfast and dinner. I did end up compromising and 'cooking to my kids' 2X a week. I'll make double salad batches those days and add a chicken breast or salmon fillet. If you need some motivation or guidance for creating a meal plan....check mine out. If are interested in Annaliisa Kapp's 30 Day Salad Challenge eBook, we'd appreciate your using the code 'fit4two' at checkout. We are an official affiliate for this awesome eBook because we sincerely love it and want to share it with our friends and clients.